The Kentish region enjoys some of the best cool climate vineyards and wineries in Tasmania. The North West Wine Route includes stunning Cradle Mountain, rugged Mt Roland, patchwork agricultural landscapes, breathtaking coastal vistas with heritage towns dotted along the way. Sampling wines and fresh local produce grown from the region's rich 'chocolate' soils should not be missed when touring Kentish! Honey, raspberries, strawberries, blueberries, olive oil, beers, wines, spirits, cheeses, fresh fruit and vegetables can be tasted and purchased locally. Ready to eat or relished later, delicious Kentish produce is a special indulgence that will add flavour to your amazing journey. 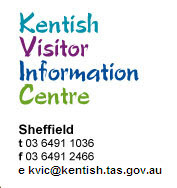 Kentish is a friendly and welcoming region. Why not make time to visit the boutique wineries and brewery for tastings and sales. The opportunity exists to meet the winemakers and growers. Relax and indulge with food and wine to tantalise the tastebuds! Don't miss the chance to explore Cradle Country whilst on your culinary journey along the North West Coast of Tasmania! Check out the Wine Industry Tasmania website to discover more information on the Tasmanian boutique wine industry at www.winetasmania.com.au/wine-route.